So those of you that know me well will know that I have studied hard for an MA in English Literature at Anglia Ruskin. I suppose you could say that I have a bit of a love affair with the academic side of life and especially for trawling through cavernous, dusty libraries in university towns - my favourite being the University Library at Cambridge Uni. I tell myself that I very much want to stay in touch with this academic way of life, if nothing else to stretch my mind further than I have done already. Enter stage left the opportunity to become part of panel of book reviewers for the Annotated Bibliography of English Studies. This came about in the usual form of an email from one of my Anglia Ruskin University lecturers and I thought to myself "and why not". If nothing else I get to receive new books, write about them analytically at a high academic standard and to keep the texts, all the while embellishing - hopefully - my CV and thus employability. My first, and to this date, only foray back into the world of literary criticism came in the form of James Loxley's Critical Introduction to Ben Jonson. 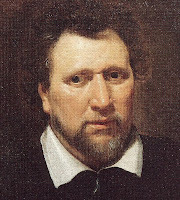 Jonson was a Renaissance dramatist around the time of Shakespeare and was, despite what you may think, always more popular than old Billy throughout his life. Anyway, what I thought would be a simple process is getting more complex. Give or take time to receive and read the text, it seems to have taken months to get the review finally sorted. First of all the man who sends the books was ill which delayed the arrival of the book; then when I first submitted the review there was something missing so it got sent back to me; then I realised I hadn't sent the copyright consent form to the publisher; then another oversight on my part whilst writing the review meant it was sent back again. Finally, I'm guessing it has been accepted, but I'm just waiting for another email warning me that something has been missed again; it's all so much harder than I thought!